When someone asks about the burst pressure of pipe, the best answer is a theoretical one. Burst pressure is literally the pressure that a pressure vessel like pipe or tube can handle before rupturing or “bursting”. Environmental conditions and other factors can play a part in how a pipe will fail. Designing of a pressure vessel and selecting the material to be used can be a complex process. One must refer to the appropriate ASME BPVC code and should not simplify the process by only finding an approximate burst pressure of pipe or tube. There are formulas that can be used to help estimate pipe or tubing’s burst pressure. The following should be used as a reference only. Corrosion Materials is not liable for any damages that may occur if information presented is used in any way other than as reference. The two most commonly used formulas are Barlow’s and Lamè equations. Burst pressure is a function of the material’s strength and pressure vessel dimensions (i.e. wall thickness, inside and outside diameter). Temperature can also affect the burst pressure since variations in temperature can have a direct effect on materials strength. The following discussion will take only room temperature conditions into consideration and this information should only be used a guideline or reference. A safety factor must be taken into consideration when calculating working pressure. Barlow’s Equation is made for calculating internal pressure. This can be either Burst Pressure or Yield Pressure depending on what material property is used in the equation. Quite a bit of information can be extracted from this equation, but what is important is that you have a defined purpose. If you wanted to know at what point the material would begin to plastically or permanently deform, you could use the yield strength. That is why the ultimate tensile strength is used to find the bursting pressure or the point at which the material ultimately fails. Lamè Formula – Barlow’s is a good formula to use for all pipe, tube or cylinders. This formula was simplified from the complete Lamè solution. Below is a simplified iteration of the Lamè formula. 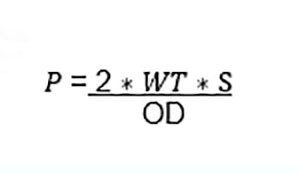 Check out our online Burst Pressure Calculator using Barlow’s Equation. Enter the values for tensile strength (PSI), wall thickness (Inches) and outside diameter (Inches) into the form. The ‘Compute’ button will calculate the burst and working pressure. If you do not have all the information for the calculator and would like technical assistance with your project, call 1-800-455-2276 to speak to Jacob Rodriguez, our Metallurgist and Technical Services Engineer. Steel Pipe: A Guide for Design and Installation, 4th Ed. (M11), pg. 45, American Water Works Association Staff.